This page shows interesting railroad happenings as well as breaking railroad news. Check it often as you may learn the location or schedule of some interesting equipment in time to go out and get some great photographs! If you do go photo 'fanning, please share your pictures with and contact News Page Webmaster Wally Weart. Photo specs: 800 X 600, max of 1024 X 800 72 dpi or ppi is standard for the web. GIF or TIF is preferred as these are considered lossless versus lossy (A lossy compression (JPG) method is one where compressing data and then decompressing it retrieves data that may well be different from the original). I reduce some pictures to 559 x 380 if I put them side by side. Please remember that the photos are copyrighted and neither the pictures or text can be used without permission of the owner. RTD's newest commuter rail line opens for passenger service next Friday, April 26. The RTD board has authorized two weeks of free rides on the G Line after the April 26 grand opening ceremony through Saturday, May 11. (The public can ride all RTD rail lines for free on Saturday, April 27.) We encourage people to jump on board and see firsthand all the places in the Denver metro region where RTD?s newest mobility option can take you. Hope to see you next Friday! 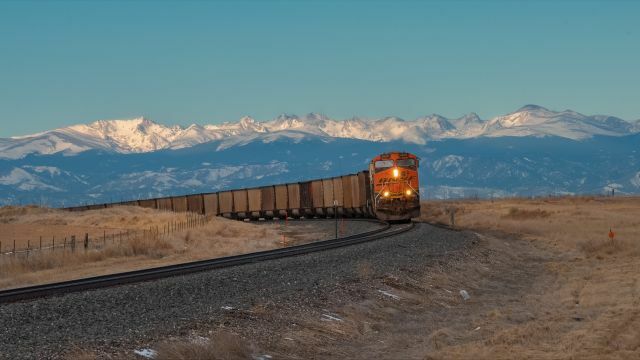 The Western Pacific Heritage locomotive visits Colorado. Click on this link https://spike150.org/ to purchase tickets https://spike150.org/train-excursion/ to ride behind 4014. The Tahoe is going home. Retired ARCOSA Lightweight 208-1, EMD model G8 built 1954 as CN 851, sits ignored along Highway 93 south of Boulder, CO, 1 March 2019. Operation was once known as Trinity Lightweight. March 3rd Winter Park Express ski train zips through fresh snow in Arvada, Colorado, mile 9.75, on Union Pacific's Moffat Tunnel Subdivision. The train is running 30 minutes late and the temperature is 3 above, but the skiers will have plenty of powder at Winter Park to enjoy. �19 Joe McMillan, March 3, 2019. 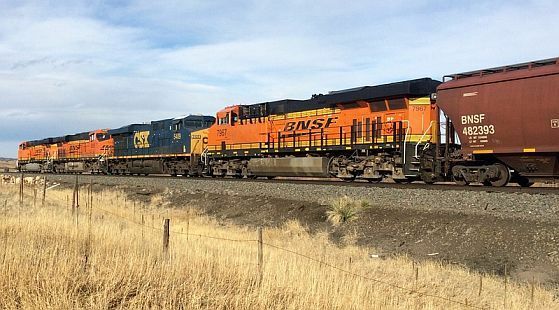 BNSF 9131, SD70ACe, was an LNG (Natural Gas Dual Fuel) test unit. 9131 was rear DPU on Black Thunder Mine, WY, to Smithers Lake, Texas, coal load C BTMSLP-033a. 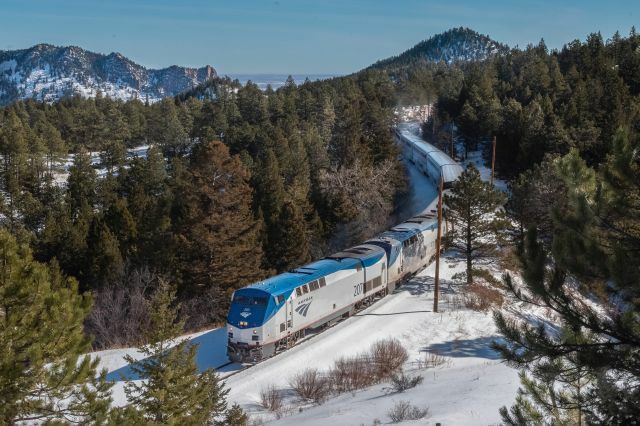 Train was at South Denver, CO, 26 February 2019. 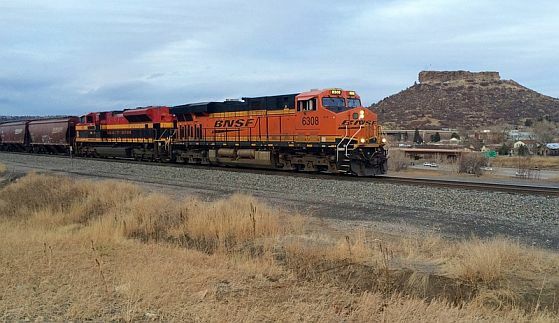 The BNSF's LNG (Liquified Natural Gas) ACE's was picked up from the TTC (Transportation Center) east of Pueblo, CO, 26 April 2014. LNG experiment began on BNSF November 2013. Observations regarding LNG Tests-Support of natural gas-fueled locomotives will require significant investments in new fueling infrastructure that are duplicative to established diesel based infrastructure. These infrastructure investments and their associated operating costs must be accounted for in any evaluation of cost effectiveness. Bartlett Grain is nearing completion of their new 400,000 bushel silo at Towner, Colorado. In talking with the elevator manager, he said they send most of their grain east on the K&O to Wichita, Kansas of Great Bend, Kansas. I asked him if they planned to ship on the Towner line to the west when it opens. He said no. I traversed the Towner line all the way to NA Junction. Nothing has changed except the line continues to deteriorate. The new owner doesn't seem to be in any hurry to reactivate the line. I also talked with a UP track inspector who lives in Eads, Colorado. He said the Bartlett elevator in Haswell, Colorado has closed and the one in Eads is about to close. That eliminates any elevators of size providing new business for the Towner line. Most of the grain is being trucked to Cheyenne Wells, Colorado and shipped on the UP. Eastbound Kyle RR lettered Utah Railway 5004, MK50-3, passed the closed World's Wonder View Tower built after 1926. View tower is near Genoa, CO, January 17, 2019. Charles W. Gregory, Colorado's P.T. Barnum, would stand on the Tower and spot license plates of approaching cars. When tourists were within earshot, he would boom state-appropriate greetings through a megaphone. "How're things in the Buckeye State?" His billboard motto was Eat, drink, gas, and pop at the Tower. Charles W. Gregory died in 1943, and then the interstate bypassed US 24. Copyright 2019 Rocky Mountain Railroad Club.